The Indian Kathak dancer Kaveri Sageder is originally from Pune/India, now mostly living and working in Vienna. Next to her work as an international performer, she runs her own Dancing Studio in Pune and regularly teaches in Vienna. To EDUCULT she talked about her first experiences and establishment as an Indian artist in Austria and, being married to an Austrian musician, cultural differences she faced, both in her private and her professional life. EDUCULT: Please, you may just start by telling us, why you are here in Austria. 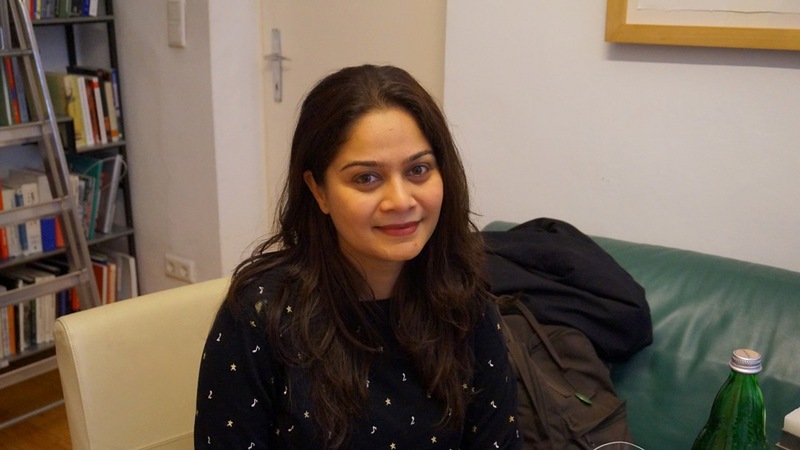 Kaveri Sageder: My name is Kaveri Sageder. I was born in Pune-India some 180 km away from India’s economy capital Mumbai. In 2002, I came to Austria to work with young artists under the guidance of two visionary leaders of two art institutes – The “Kulturzentrum AKKU” in Steyr and the “Nad-Roop” in Pune. My dance-teacher/guru Shama Bhate is the head of Nad-Roop and she had the idea -together with the composer and bassist Helmut Schönleitner from Steyr- to bring young dancers and musicians from these very different places and put up a show. The singer of the band was Philipp Sageder, who is now my husband. Very soon, he and I found out that we had very similar interests in each other’s culture. As a very traditional artist, I was not sure if I will be able to survive as a dancer in Austria or if there even was a place for my art. So Philipp suggested that “before you think of living here, you have to find out, if Austria is a right place for you or not.” Life in Pune/India is very different. There I have my own community, artists, musicians, people who already know my art, and here, in Austria everything was new. Nobody knew what Kathak – the name of my dance style – even means! So you had an artistic background also in India? Yes, I am a professional Kathak dancer. Kathak is a North Indian classical, traditional dance style. I started training at the age of 4 and never stopped dancing and teaching until I finished my Master’s in dance at the University in Pune. After that, I toured for some years as a solo dancer and with dance groups throughout North America and Asia and was happy to be the first Indian dancer who got a Fulbright Fellowship to study the relation between Kathak dance and western music in San Francisco. Before we go into this kind of details, you said your guru came to Steyr, AKKU, when you came here for the first time. Why did your guru choose Steyr? My Guru Shama Bhate was touring as a Kathak dancer with the world famous percussionist and drummer Trilok Gurtu. Helmut Schönleitner was the director of the “Kulturzentrum Akku” in Steyr. After attending a performance, he asked my Guru Shama Bhate if she would like to come to Austria to work with young musicians and teach them Indian Rhythms. There the idea originated between the both of them to work on a project where a group of young musicians from Austria collaborates with a group of Kathak dancers from India. It was a coming together of world-jazz-music with my traditional Indian dance style. The following years we continued this work and toured in Austria and India. Maybe I ask now a very silly question, but did this kind of cooperation work? And if yes, what I assume, what is the common basis? Music! For me and my two dance colleagues, it was very exciting to come out of India for the first time and see the world outside. My Guru’s idea was to explore another music scene. Instead of having Indian artists who play Indian instruments like tabla, sitar, flute, suddenly we were exposed to the new sounds like drums, trumpet, bass guitar, keyboards… All these new inputs were very challenging. On the other hand, for the Austrian artists it was very challenging too, they were very attracted to Indian rhythms, and its treatment. Finding a common ground was a big learning process for all of us and it still is! I am very glad that I was part of it. Has there been any kind of difficulties to understand each other, also in musical terms? A lot. Firstly, because of the language. None of the dancers spoke German back then. Our conversation language was English and neither the Austrian side nor we were nearly perfectly able to express everything in it. The food was totally different; the working style was very different. The weather was very cold in Austria – no sunshine, so these were all challenges for us, but fortunately to understand each other musically was the easiest part of it- at least for me. Another thing was that we all dancers come from a very luxurious upbringing. Luxurious in the sense that we could concentrate on our studies and our passion, dance. At home we didn’t have to do anything! We were not used to cooking, ironing, cleaning etc. The reason why we came to Austria was the collaboration, so we were already prepared to face the new situations. Musically we all knew that it was going to be challenging and we were ready for that. Each one of us was open-minded and happy to accept the new and hard ways to reach our goal. Thanks to our positive approach, we found solutions to most of the difficulties; sometimes it just took a bit more time to find out what the other person really wanted to tell. But when words can’t describe something precisely enough, music becomes a much better conversation tool. You were talking about a political framing, and we will maybe discuss more in general that there are so many problems about cultural identity, defining our own thing. Now you said, you came together, and it was easy to find each other on musical terms, you had no big problems. Not really, in fact, we all enjoyed the process. I remember that everything sounded so strange, since our ears were not at all used to this band sound. When you study music, you get used to certain sounds that define the specific genre – in our case it’s the sound of the tabla, the North Indian drum-set so to say, that helps us keeping musical cycles and patterns. Suddenly, the role of this instrument was substituted by a western drum set and a bass guitar. It was like relearning to speak a language and redefining a basic set of rules to communicate clearly again with each other. But did this process change yourself and if yes, in which way? Yes. As I have mentioned earlier, I always had help around back home in India. My focus was solely on music and dance! My experience back in Austria and then 2005, when I got the Fulbright Fellowship to work with Jazz and World Musicians in San Francisco for a period of 6 months, made me realize that as I was away from my home setting I had to do a lot more things than just dancing. I saw amazing artists that I looked up to cleaning, cooking, shopping, washing clothes, picking up their kids, making dinner and then head for a concert, and this is quite a normal schedule in the life of a western artist. I needed some time to learn all these things, this sort of time management was a big quality which I wanted to master. No. In fact, after our collaboration, when we went back to India, our artist friends were very keen to know about the process. Many of them were positively jealous of us having this beautiful opportunity. I am very lucky to have very supportive and open minded people around me. People were encouraging me to keep going out and to make new experiences. Would you say at home or where you come from this is a general attitude, also in cultural policy terms, inviting artists to go abroad, to exchange, to be open minded? 50 years ago, of course, people were saying to Indian classical musicians who started traveling abroad that “you are destroying the purity of the music, you’re diluting, you come back with these western influences, why are you performing with rock bands, and you are not a pure Indian classical artist anymore”. That’s what I wanted to know more about: this straight Hindu philosophy against external influence. In Pune, where I come from in Maharashtra, education is very important. People respect you when you say, “I am going for higher education “. One should be very careful about not destroying these traditional, strong beautiful art forms just for the purpose of making something new or for the sake of innovation. My dance style is originated in Hindu Temples telling stories about Gods and Goddesses but the art form is not for religious purposes. For me being Hindu is a way of living with practical and scientifical application in my daily life and it’s not a dogmatic belief system. But Indian classical artists like Ravi Shankarji, Zakir Hussain,etc. have proved that Indian music will stay pure in its original form, it can be strongly connected to its roots and still stand equally strong in a new musical environment like jazz or electronic music. And there are no hardliners around saying that you are not allowed to behave like that, you should concentrate on your own, to defend your own? Whenever we performed in different big cities in India with non-Indian musicians, everywhere we invited art critics, local musicians, our gurus or respected people, to see the work we were doing; everywhere we had very fantastic reviews. In my field, it’s very important to gain the positive replies / blessings from our teachers. The gurus might just warn me from time to time, after I decided to be in Austria to marry Philipp: “you will be out of the Indian scene; you might have to really start from the base and settle there in Austria”. But I happily accepted the challenge and with the fact of regularly visiting my home and connect to the scene there, I felt like having the best of both worlds with me. You talked about the musical connections, and you also started to talk about your personal relationship connected with the changing social surrounding. Your husband said, “be careful, try to find out how it will work”. Could you give us some of your experiences of the changing social environment here in Austria compared to what you had experienced in India? In 2008, Philipp and I got married. Austria wasn’t a totally new place for me. Philipp is not Indian; we are not from the same cultural background. Back then, I didn’t even start to learn German. But people always helped me, whenever I said that I am an Indian artist, I am an Indian dancer, and I always had a respectful acceptance in my new family and in society. Philipp’s family was always very positive, they were very encouraging, and always giving me support. In the beginning Philipp’s friends were the only friends I had, but when I started teaching, offering workshops, performing regularly in Austria, I started establishing my own contacts and making my own friends. I really started enjoying the process to kind of start all over. The last 6 years I was living in the 16th district close to the famous Brunnenmarkt. Being very close to Brunnenpassage helped me making friends. I started attending the performances and workshops there and one day I got an offer from the Brunnenpassage team for teaching regularly Kathak. This was my first fix job in Vienna. People’s interest started growing about my style and gained confidence to settle in Vienna. So it was easier for me to be away from my family and friends in India. And this is fine for you? Yes. The Sageder and Agashe families have good understanding between each other. My parents do visit me at least once a year. I could go any time to India so the fear of not seeing your own people was never there. The question remains, two people from a different cultural background decide to have a common life – is there any remaining foreignness or is it irrelevant in this personal relationship? In the beginning, it was hard to understand the two totally different cultures, languages, etc. But if you respect and love each other then everything becomes easier. We learn so many new things from each other and we tried to incorporate these in our lives. And you won’t become Austrian? In my heart I will always be Indian since through my profession, I am connected daily to Indian culture and history. Although, I really love living in Austria, especially in Vienna- I feel I have a special connection to this place. My son is 5 years old. He was born in Vienna. Being away from India, I consciously tried to teach him my own mother tongue -Marathi. We celebrate all Indian festivals at home and once a year, we visit Pune – my hometown – to meet my Indian family and friends and have him connected to the Indian way of life. Sometimes, he compares India and Austria, but that’s very natural, since it’s really quite opposite in a few ways. When I ask him: “Are you Indian or Austrian?”, he proudly says “I am both”. You talk a lot about your positive attitude of mutual respect. When you now experience the changing political climate, not only here in Austria, but also in the neighbouring countries, what does that tell you? I hear from many people that the situation in the world is changing, and not for good. I personally keep on doing what I am doing with lots of dedication and passion. I do perform and teach regularly, and try to make a positive change through art. Coming to an end, I would like to ask you what you will be in ten years. Do you have any perspectives? Yes, I want to be an active part of a lively Indian classical music environment! I wish that Vienna -the centre of classical music in the world- hosts many more of the fantastic Indian artists. I would also like to run a centre for performing arts and dance. Is there a lively Indian scene here in Vienna? Are you in connection with them? I have many Indian friends who are settled in Austria. We do meet regularly. We try to celebrate our main festivals together but unfortunately at the Indian classical performances, there are very few Indians who attend the performance. They do appreciate it but do not attend the shows regularly and I still don’t know how to reach my own community and how to make them attend these events. The Indian embassy in Austria helped a lot Indian musicians and dancers to promote the Indian art and culture. Slowly, but steadily, there is a bigger interest in Indian classical music and dance. I do teach regularly in Vienna. 80% of my students are Austrians. Not just Austrians, I would say I have students from 13 different national backgrounds: Russia, Sri Lanka, Pakistan, India, Germany, Italy, Hungary, Bangladesh etc. I am also part of a NGO in Vienna “Verein Raga” where we are trying to promote Indian classical music performances and art. Is there any message you would give us? Is there anything you want to tell us, our readers, in connection to what we have been discussing? Just be open to different cultures and art scenes. Feel fortunate that you are able to see different styles and performances through artists who want to settle in Austria because of whatever reasons. They are people like me, who come here because of love, but there are also people who come because they have to leave their own hometowns. There is no other choice left for them. We should not forget that they are still great/professional artists, musicians, dancers. There is something unique that they can share. If we are open to this, they will flourish as performers and artists, and they can integrate much faster and far better to the Austrian society. We can witness diverse things, and one should feel fortunate about it. We have this possibility, so we should welcome this change, open heartedly. Thank you very much. I think this was a wonderful statement at the end. Thank you, my pleasure. Namaste.